Dec 5 (AZINS) International icon and desi girl of Bollywood, Priyanka Chopra, has us gawking over her bridal trousseau. The actress has each one of us mesmerised with her pre-wedding, wedding and reception outfits, so much so that we are obsessed with her lovely outfits. Whether it's PeeCee's Abu Jani-Sandeep Khosla saree that she draped for her sangeet or her dreamy Indian wedding attire or her stunning gold Falguni Shane Peacock lehenga that she wore for her Delhi reception, she looked ethreal in all and in fact, set an extremely high benchmark for brides-to-be. But apart from all these gorgeous outfits, what really caught everyones attention was the incredible Ralph Lauren gown that the actress donned for her Christian wedding, which had a 75-feet long tulle veil. While many of us are enchanted by her lovely gown, netizens can't get enough of the long veil and hence are doing what they do best! Netizens have come up with memes which are too funny to miss! In an exclusive interview with People Magazine, Priyanka Chopra while talking about the gown revealed, “For the Western wedding, we had been talking to a bunch of incredible designers, but ultimately when Ralph Lauren approached us, I learned that Ralph has only designed three wedding dresses in 50 years– one for his daughter, his daughter-in-law and his niece. I was blown away. When we went in for the sketch presentation, they created exactly what I envisioned for myself on my wedding day… and I said, ‘Yes’ to the dress." 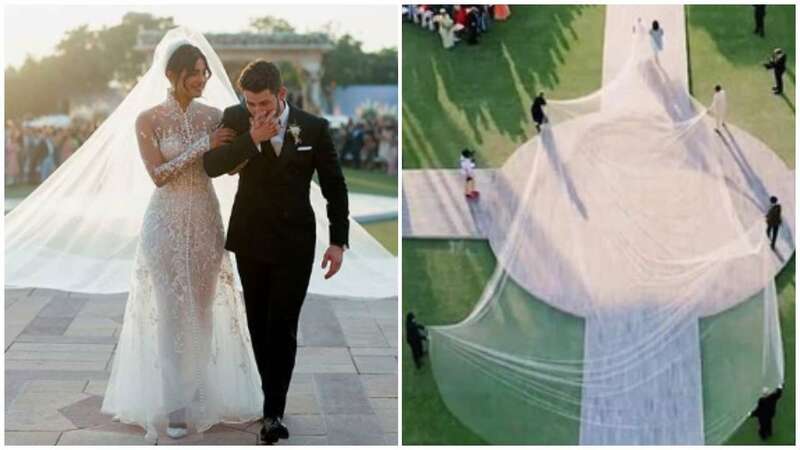 Priyanka Chopra,36, tied the knot with American singer-songwriter Nick Jonas, 26, on December 2 and 3 at the Umaid Bhawan palace in Jodhpur.